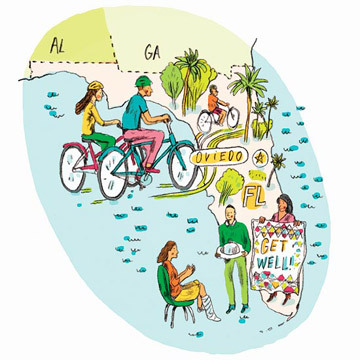 After searching the country for perfect places to call home, we chose these communities because of their top-notch schools, affordable housing, green space and giving spirit. Chicago residents Mike and Monica Corbett were diehard urbanites. 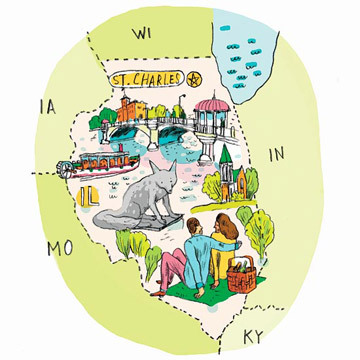 But after visiting St. Charles on a weekend golfing trip, the couple was so smitten they decided to trade the Windy City for this town, 40 miles west. It was the right choice. "We have twice the living space plus an acre of property," says Monica, 47, a music teacher. "And we can walk downtown and take in great culture and restaurants." Along with their four children—Morgan, 17, Palmer, 14, Tommy, 11, and Hadley, 8—the Corbetts spend much of their time outdoors at Pottawatomie Park, which has panoramic views of the Fox River. Education is first-rate: Last year North High became the third school in the district to earn a U.S. Department of Education National Blue Ribbon award. But Monica and Mike, 45, a finance manager, are even more impressed with St. Charles' community spirit. "I'll never forget the time a police officer rewarded kids who wore bike helmets with free coupons for ice cream, or when our neighbor offered to lend us his car while he was away for the winter," says Monica. "This place is a little slice of heaven." Every September St. Charles' high school drill teams begin fundraising for the American Cancer Society and a local health center; the campaign, which netted an impressive $74,000 last year, culminates in October at the homecoming football game, where people line up across the field and do 100 kicks. In Peachtree City families move in, but they rarely move out. Take Ron and Missy Anderson. Eighteen months after relocating here from Cincinnati in 2006, Ron was laid off from his IT job. He eventually found work in Toledo, Ohio, but instead of moving his family, he opted instead to make the long commute on Sunday nights and return home every Friday. "We couldn't have done this if our kids were really young, but Alex is 18 and Cortland is 15," says Ron, 46. "I get homesick a lot, but we're so happy here. We couldn't imagine leaving." The top reasons are a robust school system and strong community ties, including a close circle of friends. 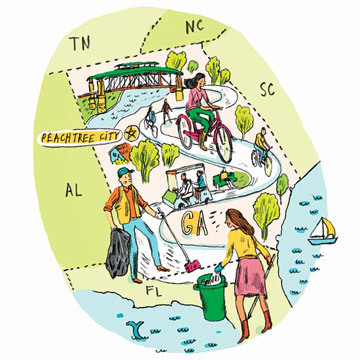 Residents affectionately call Peachtree City "the bubble"—a haven of sorts where folks ride bicycles and drive golf carts along winding town pathways, and where teens don't think it's uncool to hang with their parents. "Living here isn't just easy," says Missy, 44, a stay-at-home mom. "It's almost too good to be true." This May nearly 400 volunteers turned out for the Keep Peachtree City Beautiful program, clearing debris from the woods, tunnels and bridges along the town's paths. Residents and businesses can also "adopt" a street, path, park or stream and make it their own cleanup project. Jenny DeVry, 45, knows there's no such thing as school rivalry in this close-knit Kansas City suburb. Her 16-year-old, Kate, attends Liberty North High School, but the rest of the family—husband Hank, 51, Claire, 15, and Henry, 12—regularly attend games and parades at Liberty High as well. "This is a community with a lot of old-fashioned traditions, like supporting one another," says Jenny, a patient coordinator at an orthodontist office. The town also takes care of its kids: In recent years voters have approved $104 million in bonds to construct new schools and update existing ones. There are also ample park lands, miles of bike trails and the 146-acre Fountain Bluff Sports Complex. "Children here are given plenty of opportunities to follow their interests, whether it's playing basketball or joining the debate team," says Hank. "Liberty is a one-of-a-kind place." The 200 members of the Liberty Giving Circle each contribute $300 a year to local charities, including a food pantry and a thrift store. Katie Turner, 42, will tell you there's no shortage of fun family activities in this suburb outside of Mobile. One of her favorites is the seafood jubilee. Every summer, due to a mysterious confluence of temperature and tide, thousands of crabs, shrimp, fish and oysters turn up in shallow water or beach themselves on the sands of Mobile Bay. "Pretty soon everyone is dragging buckets, tubs and ice chests to the shore in the middle of the night," says Katie, who often joins the crowds with husband Lee, 45, daughter Grace, 15, and 13-year-old triplets Jordan, Josh and Lot. But Fairhope offers more than charming coastline. The couple, who co-own an insurance company, also enjoy hanging out at the French Quarter, a shopping district downtown. And last year residents voted for a new tax to help public schools preserve and expand their academic and athletic programs. Says Katie: "We've got the great outdoors, good schools and good neighbors—everything a family could want." Through an art showcase event and other fundraisers, the Fairhope Educational Enrichment Foundation raised $250,000 to construct a 250-seat theater at a local high school. You could say that Rick and Tina James demand a lot from their kids. Brooke, 19, is a pre-nursing major in the Honors College at Texas Tech, and Ashtin, 17, is taking every AP class possible at Friendswood High. 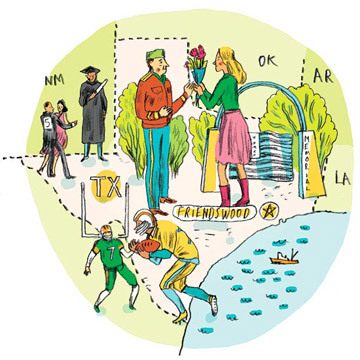 But academic ambition runs deep in this town, midway between Houston and Galveston. "Most of the kids we know—not just ours—work hard to get good grades and rank in the top of their class," says Rick, 49, an attorney. Younger daughter Rianna, 11, dances competitively, and 8-year-old Mason is into team sports. Moms and dads step up too: Mason's football team has five parent coaches for its 20 players, while his Little League team has four. At Mason's elementary school, "room moms" regularly assist teachers. "Friendswood is all about community and supporting our kids," says Tina, 48, a pre-K teacher. 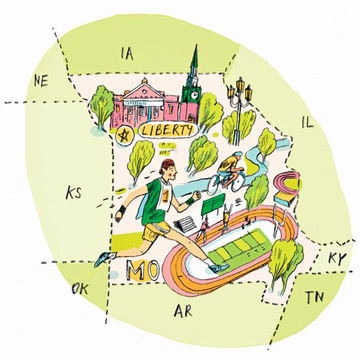 "On top of that, there are beautiful neighborhoods and green space. In a word, it's ideal." When residents decided in 2008 that Friendswood needed a veterans memorial, they raised $110,000 and got businesses to donate materials and labor. Today, the monument, which includes a steel flag flanked by granite columns, sits on a 3,500-square-foot site amid olive and oak trees. For Reeta and Abhinav Raina, the archway at Novi High School speaks volumes. 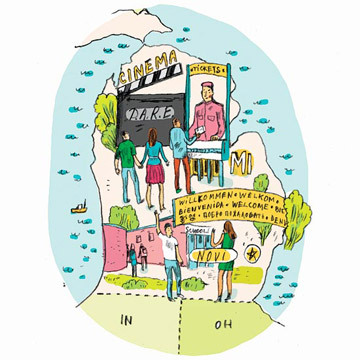 With the word "Welcome" inscribed in 25 languages, it's a symbol of the diversity that distinguishes this fast-growing Detroit suburb. Asians account for 15% of the population, and at Novi High, sons Jay, 18, and Raj, 15, can take International Baccalaureate classes as well as attend German, Irish, Polish, Chinese and Indian cultural shows. "For us, diversity is just as important as good schools, low crime and green space," says Reeta, 45, an optometrist. "Novi is also a progressive, forward-thinking place," says Abhinav, a 51-year-old cardiologist. He's proud that Jay has a seat on the parks committee and votes with his adult colleagues on how and where to allocate funds. Raj serves on the youth council, organizing programs like the "Addicted to Movies, Not Drugs" campaign with a local theater. The boys play hard too—both have been members of the soccer and basketball leagues. And they know firsthand that Novi is a place where neighbor helps neighbor. When Jay and his friends lost their tech gadgets and games in the park, a good Samaritan found Jay's name on his iPod and called all the Rainas in the phone book until he found the right family. "This guy went out of his way to return everything," says Raj. "That's the type of community we live in!" The Baronette Renaissance Hotel offers a free, one-night stay to Novi residents who participate in annual volunteer projects; last year people could opt to plant flowers at the Civic Center for four hours or to help create a mile-long nature trail for an elementary school outdoor science class. 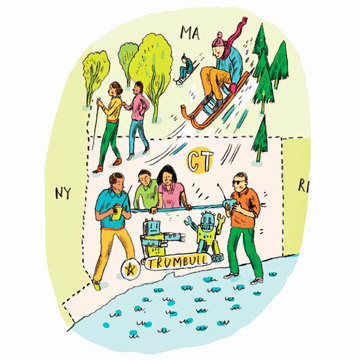 It's the simple pleasures that Martha Jankovic-Mark loves most about this picturesque enclave, 60 miles north of Manhattan: strolling along the Long Island Sound, going sledding on the nearby hills in winter or hiking in summertime on the Pequonnock River Valley trails. "We just like getting the family together for good old-fashioned fun," says Martha, 51, a part-time lawyer who volunteers on the city council. She and husband Larry, 52, also appreciate the academic and sports programs at Trumbull's schools. Children Jon, 20, Alex, 17, and Larissa, 15, have participated in everything from mock congressional hearings to robotics team competitions to skating tournaments. "All the kids have formed relationships with their teachers and coaches, and have seen up close the commitment they bring to their work," says Larry, a software engineer. "It's inspiring, and they've been enriched by it." Adds Martha: "Some people say New Englanders are chilly, but people here are warm and really help each other out. Trumbull is a jewel." The volunteer group Trumbull Community Women works nonstop all year every year, holding food drives for the needy, raising money for schools and veterans organizations, and tidying up the town by collecting trash along roads and hiking trails. 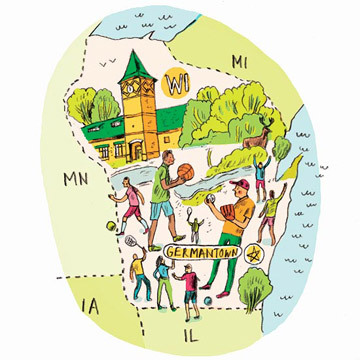 With more than 400 acres of green space plus a large nature preserve, this leafy town near Milwaukee is a place where people love to play ball. Dave Wegener, 49, figures he's coached about 50 sports teams over the years, starting when son Andy, 25, was a tot. "On any given Saturday there could be thousands of people in just one park," says Dave, who's also dad to Michael, 18, Hayden, 15, and Madelyn, 13. "Our parks are the place where families meet, greet and connect." He and wife Lisa, 51, an accountant, are also big fans of Germantown's schools, which rank among the best in the state in reading, math and science test scores. "Face-to-face or by e-mail, there's an easy, open dialogue with our kids' teachers," says Dave, a vice president at Mount Mary College. And their dedication and caring goes beyond the classroom. "When Michael broke his leg, his third grade instructors not only helped him get around school, but even delivered his homework assignments to our front door," says Lisa. "You couldn't ask for more." Community service starts early here: Working with the local Kiwanis Club, elementary school students volunteer at senior centers, collect donations for the humane society and host family bingo nights to raise money for food pantries. 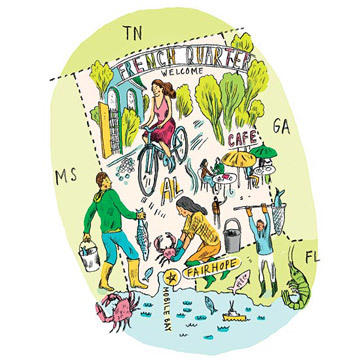 The nation's premier theme parks may be just a 30-minute drive from this sunny Orlando suburb, but Tom and Connie O'Hanlon and their two teens don't have to get in the car to do something fun. Instead, the family enjoys biking on the 22-mile Cross Seminole Trail, taking walks around scenic Lake Charm and jogging under the majestic oaks lining the streets. "There's something calming and beautiful about running from one shade tree to the next," says Tom, 51, a real estate investor. Daughter Katie, 18, and son Zachary, 17, pedal to and from Oviedo High School, where some 70% of students who take Advanced Placement tests score a 3 or higher. And residents know they can count on their friends and neighbors. When Katie was injured in an accident in February, people delivered home-cooked meals every night for two weeks and made her a get-well quilt. "My in-laws, who came to help while Katie recovered, were amazed," says Connie, 48, a property manager. "We weren't. We know we've found paradise here." The HOPE foundation, founded by resident mom Krissy Todd, aims to prevent homelessness through outreach and education services to 6,000 central Florida families every year. There are times when Brenda Habenicht, 46, just can't make it to parent-teacher conferences for her kids—Lindsey, 16, and Alex, 13. No worries. Chances are she'll run into their instructors around town—and get a full progress report. "One Saturday I had a 20-minute conversation at the market with Lindsey's history teacher," she says. "Another night we were at a school rally when Alex's math instructor came over to tell me that he had gotten a perfect score on a test." That kind of dedication is just one reason why Brenda and her husband, Brett, 44, who own a coffee-roasting business, love this Seattle suburb. Another is Maple Valley's top-rated Tahoma school district, where students score among the top 10% in the state. 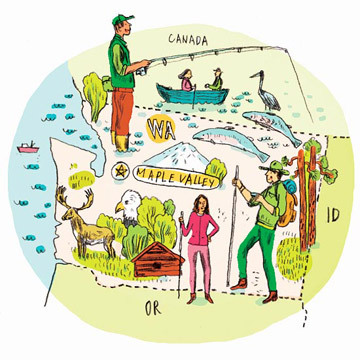 Homes are affordable, and despite more than doubling its population in the last 14 years, the town retains its rustic charm. The Habenichts often go hiking, fishing and boating at Lake Wilderness, a 117-acre park with a spectacular shoreline, towering evergreen forests and meandering pathways. "You can see bald eagles, blue herons, bears and elk up close," says Brenda. "But it's not one thing that makes living here special. It's the natural beauty combined with a strong sense of community—plus, we're only 40 minutes away from Seattle or Tacoma. It's an unbeatable combo." The Maple Valley Rotary Club, which raises some $100,000 for charity every year, recently donated $50,000—and recruited hundreds of volunteer workers—to refurbish a gym for a nearby town. With the help of Onboard Informatics, a New York City research firm that provides real estate, demographic and other data, Family Circle initially assembled a list of 2,500 cities and towns with populations between 15,000 and 150,000. We narrowed that down to nearly 1,000 localities, all of which had a high concentration of households with median incomes between $55,000 and $95,000. We then assessed which places best meet our family-friendly criteria—including affordable homes, quality schools, access to health care, green space, low crime rate and financial stability—and ranked them from top to bottom. Family Circle selected the 10 winners from among the highest-rated towns. The Great Schools rating listed for each town is based on the performance on standardized tests by local elementary, middle and high schools relative to other schools in the state, rated on a scale of 1 to 10. A rating of 10 means that overall test scores are as good as, or better than, 90% of scores elsewhere. The ratings are provided by GreatSchools.net, a nonprofit website with a mission to improve education by inspiring parents to get involved. To find out how your child's school is doing, go to the site and enter your school's name and state for test results according to grade, stats on student-teacher ratios and diversity, and parent reviews.